The views from Devil Canyon Overlook are truly spectacular, whether one is looking up or down Bighorn Canyon. The more than 1,000 foot (305 m) canyon walls tower over the sparkling blue waters of the Bighorn River and Lake, a narrow ribbon far below. Occasionally, bighorn sheep, for which the mountains, river, lake, and park were named, can be seen from the overlook, grazing at patches of grasslands on the open benches above the cliffs. But the most prominent wildlife visible from the overlook are the birds. White-throated swifts are most numerous; they zoom by at more than 100 miles (160 km) per hour, sometimes so close one can feel the wind from these black-and-white speedsters. Their cigar-shaped bodies and swept-back wings are perfect adaptations for their aerial maneuvers. As many as two dozen of these 61/2-inch (16.5 cm) birds are usually present at any one time of day throughout the spring and summer. The slightly smaller violet-green swallows, identified by their violet-green colored backs and snow white underparts and rumps, can also be common. The master of the high cliffs and canyons at Devil Canyon Overlook, however, is a much larger, faster, and more powerful bird than the swifts and swallows. This is the peregrine falcon, considered one of the speediest birds in the world; they have been clocked at more than 200 miles (322 km) per hour in a dive. Peregrines are approximately the size of red-tailed hawks but possess pointed rather than rounded wings, light underparts with faint streaks, and dark backs; males can be slate gray but females are lighter colored. They also possess dark hoods and moustachial stripes, heavy black sideburn markings on their cheeks. Peregrines are native to the Rocky Mountains and have long been an integral part of the Bighorn Canyon ecosystem. But by the mid-1970s, peregrine populations in all of western North America had been reduced by 80 to 90 percent due to DDT poisoning. By 1972, peregrines were placed on the endangered species list, and DDT was banned from use in the United States and Canada. A special captive breeding program was initiated by Dr. Tom J. Cade at Cornell University in 1970, and captive-bred peregrines hatched successfully three years later. Bighorn Canyon released its first captive-reared birds in 1989; during the next three years a total of 16 peregrines were introduced into the park. Some of those birds are expected to serve as a nucleus for a new breeding population of these incredible birds at Bighorn Canyon. Peregrines hunt by diving on their prey from above and can easily kill pigeons and ducks with a single blow. They actually strike their prey on or near the back of the skull with a partly open fist, either severing the spine or crushing the skull. They even take the smaller, but swifter, white-throated swifts. Their ability to time their dive so perfectly that they are able to hit a swift flying at 100 miles (160 km) per hour is difficult to conceive. And then, instead of letting their prey fall to the ground, they actually turn and retrieve their kill in midair. They then carry their prey to a high perch or to their nest to either consume it or feed it to their nestlings. The weight of a swift is nothing compared with a mallard or common merganser, more typical prey of peregrines at Bighorn Canyon. The ability to carry that added weight upward 1,000 feet (305 m) to its perch is mind-boggling. See chapter 16 on Grand Canyon for additional information about this incredible falcon. Devil Canyon Overlook is undoubtedly the most likely site to watch for this speedy raptor. Although peregrine observations are rare, they are expected to increase as the species begins to utilize the high cliffs for nest sites once again. The Bighorn/Pryor Mountains of north-central Wyoming and south-central Montana are the first high mountains that a traveler coming east is likely to encounter. They are the easternmost range of the Rocky Mountains and rise directly out of the vast prairie grasslands. The Bighorn/Pryor Mountains are sliced in two by the Bighorn River, the Pryors on the west and the Bighorns on the east. Bighorn Canyon National Recreation Area (120,000 acres or 48,563 ha) extends for 65 miles (104 km) from near Lovell, Wyoming, to near Hardin, Montana. The meandering, 71-mile-long (113 km) Bighorn Lake, dammed by Yellowtail Dam near Fort Smith, Montana, is the centerpiece of the park. The National Park Service administers the national recreation area, but much of the park lands in Montana are controlled by Crow Indians and are closed to the public. Another portion of the area is jointly managed by the National Park Service and Bureau of Land Management as part of the Pryor Mountain Wild Horse Range. Access to the area is limited. The southern district can be reached off Wyoming Highway 14A, from a 20-mile-long (32 km) paved road that provides access to Horseshoe Bend, Devil Canyon Overlook, and Barry's Landing. The northern district of the park can be reached from Montana Highway 313 to Fort Smith, and then from a 10-mile-long (16 km) paved road as far as Ok-A-Beh Marina on Bighorn Lake, with side roads to the Afterbay and Yellowtail Dam. Three visitor centers exist within or adjacent to the park: Bighorn Canyon Visitor Center, with exhibits, at Lovell; Fort Smith Visitor Center near Fort Smith; and Yellowtail Dam Visitor Center, operated by the Bureau of Reclamation, at Yellowtail Dam. Each of these centers has an information desk and sales outlet where one can obtain bird guides and other interpretive materials. A checklist of park birds is available for the asking. This list is largely based upon a thorough inventory of the park's birds and mammals that was undertaken in 1984 by Craig T. Patterson. Also available is Canyon Echoes, an interpretive newspaper that includes an interpretive schedule for both districts of the park and other pertinent information. Campgrounds are available at both ends of the park, but hiking trails are limited to three in the north and four in the south; two are nature trails: Beaver Dam Nature Trail at the Yellowtail Visitor Center, and Crooked Creek Nature Trail off loop C at Horseshoe Bend Campground. Vegetation within the park varies with elevation and rainfall; the southern portion is much drier than it is in the north because it falls in the rain shadow of the higher and more massive Absarokee-Beartooth Mountains to the west. The dry, southern slopes of the Bighorns are dominated by Utah juniper and big sagebrush. Curl-leaf mountain mahogany is common at slightly higher elevation. Limber and ponderosa pines and Douglas fir are present on cooler, north slopes of the higher canyons. Larger stands of ponderosa pines occur in the north. The common shrubs of this community include littleleaf sumac, holly-grape, common juniper, poison ivy, and yucca. Above the ponderosa pine stands on the rounded mountain tops is a vast grassland community, much of which is on Crow Indian land and grazed by cattle and bison. Arrowleaf balsamroot is abundant in places, and low-growing wild rose, yucca, and prickly pear cacti occur throughout. Riparian habitats occur along the open lake shore and streams, and within side drainages that form fingers of dense vegetation that often extend high up the slopes. These communities usually are dominated by eastern cottonwood and box elder. Common undergrowth species include chokecherry, golden current, silver buf-faloberry, and dogwood. The southern end of Bighorn Lake contains a very different riparian environment that is dominated by eastern cottonwoods, willows, Russian olives, and tamarisks. A tract of 11,600 acres (4,694 ha) of this area is managed as the Yellowtail Wildlife Habitat Unit of the park, administered by the National Park Service and managed by the Wyoming Game and Fish Department. Additional information can be obtained from the Superintendent, Bighorn National Recreation Area, P.O. Box 458, Fort Smith, MT 59035; (406) 666-2412. The high cliffs along the lake provide nesting sites for a number of birds: white-throated swifts, violet-green swallows, American kestrels, and prairie falcons. American kestrels, once called sparrow hawks, are one of the parks most colorful and charismatic raptors. They are fascinating birds to watch when they are hunting. They will hover in midair, wings flapping to hold their stationary position, while they search for prey below. Suddenly, they will dive with wings folded back to gain speed and, just before they reach their target, they will pull out their sharp talons and grasp their prey. Rodents are preferred, but they also will take small birds and snakes, as well as a variety of insects. The American kestrel is almost as dynamic as its larger cousin, the peregrine, but because of its smaller size and abundance it is too often taken for granted. This little falcon also nests in cavities on cottonwoods in riparian zones and in conifers in the upland forest communities, but they are most numerous along the canyon. Their reddish backs, the slate gray wings of the males, and black-and-white face patterns are commonplace throughout the park. Prairie falcons also occur along the canyons. This falcon is almost as large as a peregrine but inhabits drier, more open country, preying upon birds, rodents, lizards, and insects. It is easily recognized by its pale, instead of slate gray, plumage, its narrower moustachial stripes, and its black underwing markings, like black wingpits. Then there are the golden eagles, the largest of the park's raptors, with a wingspan of up to 88 inches (224 cm). These are all-dark-brown birds, except for their golden head-feathers that seem to have a bronze cast when viewed from the right angle on a sunny day. Immature birds possess whitish tails with black terminal bands, and they are sometimes confused with bald eagles. Most of the time golden eagles build their nests in out-of-the-way places on the walls of the inner canyon. But in 1992, a pair nested on the high cliff directly across the river from the Yellowtail Dam Visitor Center. On June 20, I found four youngsters, almost large enough to leave home, exploring the open ledge; I wondered how often nonflying birds fall to their doom. Through my spotting scope, I could see that one individual had not yet finished breakfast; 10 to 12 inches (25-30 cm) of a snake protruded from its beak. It took several deep gulps before it finally managed to swallow the whole thing. may result in lifetime affairs; they often hunt in pairs. Jackrabbits are their favorite prey in the West, although they will take almost any kind of mammal, including skunks, large birds, and snakes. Only when food is scarce will they eat carrion. I watched a lone golden eagle from Devil Canyon Overlook. It was flying over the grassy ridge directly across the canyon, apparently hunting. It appeared to be making a number of passes over one particular area. I assumed it was attempting to dislodge a prey species that it knew was present but hunkered down out of sight. Eagles will spend long periods of time soaring low over their hunting grounds in an attempt to frighten some prey into making a run for it. This technique apparently works very well. 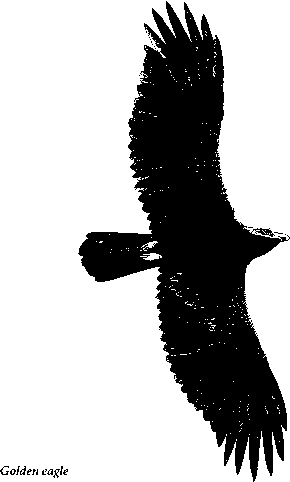 A common raven suddenly appeared overhead, a large, allblack bird with pointed wings, a wedge-shaped tail, and a large, heavy bill. Its bill was grasping a rock dove squab, undoubtedly taken from a nest on the adjacent cliff face. I had heard considerable "cooing" of rock doves below me and had seen several birds, alone or in small flocks, flying far below the overlook. I had recognized the value of these large pigeons as peregrine food, but I had not thought of other birds utilizing this abundant food base. When I mentioned my raven/rock dove sighting to Terry Peters, the park s resource management specialist, Terry told me that ravens often take squabs, and on one occasion a visiting biologist observed a raven with an adult rock dove. When I walked out onto Yellowtail Dam to better view the eagle nest, I was swarmed by cliff swallows. Their buff rumps and darker throats were obvious on these square-tailed swallows. Their low "chrrr" and nasal "nyew" calls were everywhere. I discovered dozens of birds clinging to an adjacent wet cliff that apparently contained sufficient mud for nest-building. They were extremely busy, flying back and forth, from their mud source to various nesting sites along the cliffs. The largest cliff swallow colony I found in the park was on the point of rock that juts out into Bighorn Lake directly across from the Ok-A-Beh Marina. When a boat passed near the cliff, the air was suddenly blackened with moving dots. Through my spotting scope I could see that there were at least 800 cliff swallows in that one congregation. They swarmed up over the water, flew in a wide circle, and then many returned to their nests, which were plastered on the cliff 30 to 40 feet (9 to 12 m) above the water. Waterfowl are never common inside the canyon, although substantial numbers occur on the southern and northern ends of the lake, in the Yellowtail Wildlife area and below Yellowtail Dam, respectively. The only waterfowl common inside the canyon is the common merganser, a large, mostly white duck with an orange bill and legs. Males possess a deep green head, while females have chestnut-colored, crested heads and white throats. This is one of the few ducks able to live in the confines of the canyon; most ducks require ponds or rivers with streamside vegetation. The common merganser does very well inside the canyons, however, for two good reasons: it is a fish-eating duck that does not require pond weeds and grasses, and it is able to nest on cliffs. See chapter 23 on Black Canyon of the Gunnison and Curecanti for further details about this extraordinary fisherman. The open water and grassy shores of the Wildlife Management Unit can be superb bird-viewing areas during most of the year. The best ponds are accessible via a 2-mile (3 km) dirt road that runs south from the west side of the Highway 14A bridge. Trails follow levees between the ponds that provide easy access to cattail-dominated wetlands and open water. Almost any kind of dabbling duck can be expected during the summer months, and during migration one can expect almost any of the water birds. During my mid-June visit to the area, I found more than 400 American white pelicans on the far shore. Peters explained that their nesting attempts at Pathfinder Reservoir, near Casper, Wyoming, had probably failed, and they had moved to Bighorn Lake to fish its rich waters. Eight sandhill cranes were present, too; two or three individuals were courting, performing their wonderful crane dance, suggesting that these birds were nesting nearby. Ring-billed gulls and Caspian terns were also present over the lake or perched along the shore near the pelicans. Other birds found about the ponds and lake included a lone common loon; nesting pied-billed grebes; several great blue herons feeding along the shore; three wood ducks; four redheads; numerous American coots and killdeers; a flock of 12 American avocets; marsh wrens singing their musical trills and rattles from the cattails; common yellowthroats singing their "witchity witchity witchity" throughout the area; a few yellow-headed blackbirds and many red-winged blackbirds; and song sparrows calling "chimp" from adjacent thickets. The riparian habitats that persist along the open lakeshores and streams, as well as in the narrow draws, contain a very different assortment of birds. But one species is all-prevailing; the yellow warbler can be found in numbers in every location. I discovered that it readily responded to spishes or squeaks. These bright yellow birds reacted with surprising boldness and aggression, sometimes approaching to within a few feet of me. The male's chestnut streaks on its golden breast, all-yellow body, and coal black eyes made identification easy. They also filled the air with song, a lively, cheerful melody that has been written as "tseet-tseet-tseet sitta-sitta-see" or "wee wee wee witita weet." It undoubtedly was the most common bird song along the streams and lake in the park. Nesting was well underway in mid-June, and the boldness of these 5-inch (13 cm) golden songsters in defense of their territories was beautiful to behold. Other common songbirds of the riparian thickets included western wood-pewees, house wrens, cedar waxwings, yellow-breasted chats, lazuli buntings, song sparrows, and American goldfinches. Fewer numbers of eastern and western kingbirds, least flycatchers, black-capped chickadees, gray catbirds, American robins, warbling vireos, American redstarts, northern orioles, brown-headed cow-birds, black-headed grosbeaks, and rufous-sided towhees were encountered. I know of no other place where one can find eastern and western kingbirds living so close together, actually singing from the very same tree, than at Bighorn Canyon. Although I found several nests of both species, I did not find both nests in the same tree, although I tried. The eastern kingbird is a most attractive black-and-white bird that often sits at the top of trees and shrubs and calls loud "dzeet" notes; it sings stuttering "kip-kip-kipper-kipper" songs. Its clear white underparts and black cap, back, and tail, except for a rather distinct white tip, give it a rather dramatic appearance. Western kingbirds seem to have many of the same personality traits; they will sit at the top of trees or on wires and call loud, sharp "whit" notes, or sing harsh "ker-er-ip-ker-er-ip" songs. Western kingbirds possess gray throats and breasts, yellow bellies and crissums (undertail coverts), and black tails with white outer edges. The most numerous bird of the draws is the rufous-sided towhee, easily identified by its black head with blood-red eyes, dark back, white belly, and rufous sides. It is one of the best known of America s bird life, and so its presence may go unnoticed. But it is difficult to ignore this bird when it is courting and in full song. Males are adamant in their courtship, chasing females from shrub to shrub, or sometimes high in adjacent trees. They will fan their tails to display the large white spots on the outer edges, rapidly spread and fold their tails and wings to flash their white spots, raise their wings, fluff their feathers, and persistently sing loud warbling songs that end in a series of musical thrills. Watching towhees in their spring mating rituals is an experience not soon forgotten. The juniper woodland that occurs along the warmer slopes in the park's south district is one of the area s most unusual habitats. The presence of territorial black-throated sparrows gave this community a desert flavor; the number of singing Brewer's sparrows suggested sageflats; and territorial blue-gray gnatcatchers suggested pinyon-juniper woodlands of the Southwest. Several other birds were found within this community: mourning doves called from various perches on the low-growing junipers and adjacent rocky outcroppings; mountain chickadees called their hoarse "chick a-dee a-dee a-dee" songs; family groups of bright-blue mountain bluebirds were present (they may have nested at higher elevations and afterwards moved into the area); rock wrens were abundant at rocky areas; and chipping sparrows added their trills to the bird chorus. But the colorful, boldly marked lark sparrows were the most numerous. Lark sparrows are reasonably large sparrows with very distinct plumage: they possess all-white underparts except for a prominent black spot in the center of their breasts; black, white, and chestnut streaks on their heads; and black tails with obvious white corners. They are curious sparrows that are easily attracted by spishing and will walk about the ground with little regard for one's presence. They also produce a lovely, musical song that includes a high-pitched opening, with two clear notes and a trill, given in various sequences. The upper grasslands in the north also hold a special appeal to the naturalist, not only because of the abundant bird life but also because of its aesthetics. Early morning views across the grassy slopes with backdrops of reddish cliffs and dark green patches of forest can be spectacular. Bird song can also be appealing, although species are usually limited to the abundant western meadowlarks and Brewer's blackbirds, and to lesser numbers of American kestrels, common ravens, and vesper, savannah, and lark sparrows. Western meadowlarks often perch on fence posts or shrubs so that their bright yellow underparts and contrasting black V-shaped breast bands actually glow in the morning light. But their plumage cannot compare with their wonderful songs, typical of the western grasslands and fields: a series of rich, gurgling, flutelike, double-notes that Arthur C. Bent stated had "the flutelike quality of the wood thrush with the rich melody of the Baltimore oriole." When I was a kid growing up in Idaho, my mother often told me that the western meadowlark was singing, "Salt Lake City is a pretty little city." Meadowlark nests are rather special. They are constructed of grass and other plant materials on the ground but are woven into the surrounding grasses with an opening on one side; they are lined with fine grasses and hair. Meadowlarks feed principally on insects, including several kinds considered pests by farmers, such as weevils and Mormon crickets. They also have been found to feed on some seeds, bird eggs, and road kills. Winter birds are limited to the hardier species that remain fulltime or move into the area from more northern localities. Peters has initiated annual Christmas Bird Counts in the southern portion of the area, and these counts provide the best perspective of what species can be expected at that time of year. In 1991, Peters and colleagues found 4,479 individuals of 47 species on count day. The dozen most abundant species tallied during the 1990 and 1991 counts, in descending order of abundance, included European starlings, rock doves, house sparrows, Canada geese, mallards, cedar waxwings, American tree sparrows, red-winged blackbirds, Townsend's solitaires, Bohemian waxwings, American goldfinches, and black-billed magpies. In summary, Craig Patterson's inventory of birds and mammals documented 212 bird species within the national recreation area, of which 90 were found to nest and an additional 58 species were listed as "probably breeders." Of these 148 species, 27 were water birds (grebe, cormorant, waders, waterfowl, rails, and shorebirds), 19 were hawks and owls, and 8 were warblers. Only three species— rosy finch, common redpoll, and snow bunting—were found only during winter. Common merganser. One of the few ducks of the inner canyons, its white body and wing bars, the male's green head, and the females chestnut head, help identify this large diver. Golden eagle. This is the area's largest raptor; adults are all-dark with golden heads and fly with wings held straight out. Peregrine falcon. Although currently rare, watch for it along the canyon rim from the Devil Canyon Overlook. Its medium size, pointed wings, and black-and-white head pattern help identify this fastest of all birds. American kestrel. This little falcon can be found throughout the area; it possesses a reddish back, pointed wings, and black-and-white face pattern. White-throated swift. It is abundant about the cliffs, always in flight; its black-and-white body and swept-back wings help to identify this aerial acrobat. Cliff swallow. These square-tailed swallows usually are found in large numbers along the cliffs; they possess buff-colored rumps and throats. Yellow warbler. Probably the area's most common bird; males are all-yellow with chestnut chest-streaks. Western meadowlark. It occurs in grasslands and is best identified by its song or by its bright yellow breast, crossed by a bold, black V-shaped band. Rufous-sided towhee. This robin-sized bird prefers thickets along the river or lakeshore. It has an all-black head, black-and-white back, white belly, and rufous sides. Lark sparrow. It occurs in dry grassy areas throughout and is best identified by its black, white, and chestnut head, and bold white corners on its otherwise black tail.